Jellynote App, Other software for iPhone / iPod Touch / iPad from Jellynote. 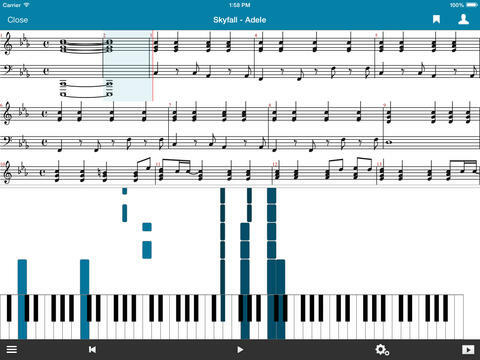 After the release on iPad late 2014, Jellynote launches its song learning app on the Android platform, for free! 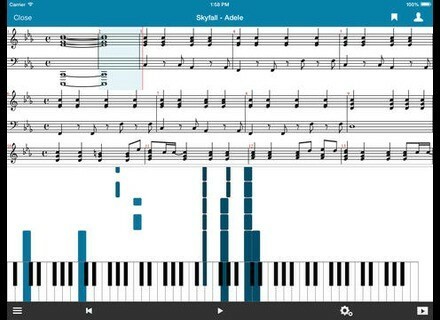 Jellynote for Android allows you to access and learn more than 150 000 music sheets, tabs and chords for guitar, bass, piano and more, for free ; song lyrics are also available. You can filter the scores by music style (rock, pop, metal, classical, jazz…), level (beginner, intermediate, advanced), instrument (128 available) and artist. Learning tools include tempo control, audio player that highlights the notes that should be played in real time, a mixer to adjust the volume of each track, multiple types of display, a tuner, a chord library, cover videos from YouTube and the app displays, for each song, the chord diagrams and finger positions. virtual fretboard and piano and included to visualize the notes in real time. Jellynote for Android allows you to access your favorite songs and songbooks offline and sync your favorite songs to your Jellynote account. A history also gives you the ability to easily find the songs you already played and you can share content with your friends. Visit play.google.com to download Jellynote for Android for free. FL Groove Studio on iOS and Android Image Line announces the availability of the FL Groove Studio music creation app on iOS and Android, under the new name of Groove Machine Mobile. Barb & Co Tantale sound library for Kronos French expert Stéphane Garganigo, also known as Barb, has released a sound library for the Korg Kronos, Kronos X and Kronos 2015 workstations.